Multiple understandings of reciprocity inform and underscore diverse ways of engaging in community-university partnerships. 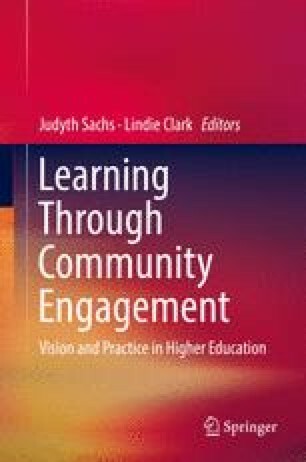 Although the benefits to students of such engagement are relatively well-documented in the literature (Eyler J, Giles DE, Jr. Stenson CM, Gray CJ, At a glance: what we know about the effects of service-learning on college students, faculty, institutions and communities, 1993–2000, 3rd edn. Vanderbilt University, Nashville, 2001; Tryon and Stoecker, J High Educ Outreach Engage 12(3):47–59, 2008), little empirical research currently supports claims that programs and partnerships result in reciprocal learning and engagement opportunities, especially from the perspective of community partners. This chapter conducts a preliminary empirical inquiry into the diverse ways reciprocity manifests as benefits for key stakeholders in the PACE context, taking the analytical framework proposed by Dostilio et al. (Mich J Commun Serv Learn 19(1):17–32, 2012), and Hammersley’s (2016) favourable critique of it as primary points of departure. We draw on the reflections and perceptions of a range of staff, students, and partners involved in PACE activities in local, regional and international settings and identify, organise and articulate some of the diversity and complexity of the relationships that exist within the PACE program and the beneficial outcomes it has spawned for different stakeholders.